You ever listen to an echo of your own voice? It’s you, a few seconds ago. Your breath, your vocal chords, your thought behind it. Not like a recording, since it’s gone almost as soon as you hear it. Your imprint, a shadow self. It started when I heard my echo in the pedestrian tunnel. I started counting things, keeping tallies. This many mailboxes. This many sprinkler heads, telephone poles, houses with red doors. Above all, never lose count. I consider myself lucky because I know about this. Nothing bad will happen as long as I keep my end up. …and so an OCD is born? You’ve painted a clear picture of obsessive compulsive disorder. Well done. Loved the description of the echo… Lovely bit of word-work. An echo to obsess about? It’d be interesting to do, as long as it doesn’t lead to more obsessions :) Nice take! As long as he believes nothing bad will happen. This is scarier than most tales with graphic descriptions. Unreasoned dread latching onto tokens. 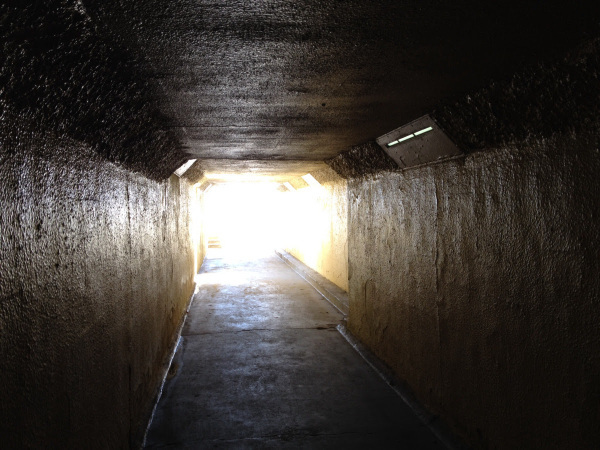 As a child, we were told to hold our breath, or lift our feet when going through a tunnel to keep the boogeyman away. I just wanted to see what would happen if I didn’t. Been haunted by that sucker ever since. :) Excellent tale! The things that go on into those gray tunnels…Nice piece. “Your imprint, a shadow self.” My favorite line! I love your explanation of an echo – I can feelyour character slipping out of touch with reality at that moment. Nicely done. Excellent depiction of OCD. “Nothing bad will happen as long as I keep up my end.” Great line! I also like the one, “I feel lucky that I know about this.” Chilling really. Oh, I think that might an exhausting existence. I hope he gives himself a little break once in a while. Great take! Very sad, but it helps understanding OCD. Great take on the prompt.